Have the places we find less pretty simply fallen into a deep sleep and do they just need an initiator to kiss them awake, like sleeping beauty? When these steps didn’t exist, the upper and lower parts of the village would be connected by a skewed concrete slope. In dry weather, debris made it slippy, in wet weather it was slippery too. No-one willingly used this passage, let alone enjoyed using it. Then one day, there were these new steps. Who had conjured them up – the residents or the mayor? Or was there a make-our-village-prettier-plan, a surplus in the communal funds? I don’t know. In any case, this place was suddenly awakened to a new life and its reputation rushed ahead of it. 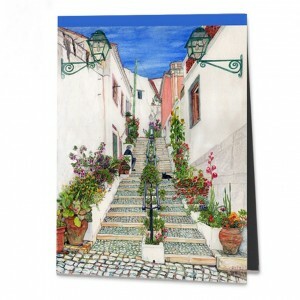 ‘Do you know the flower steps?’ – ‘Have you painted the flower steps yet?’ – ‘Aren’t Dona Esperanca’s flowers great?’ I was enthused by this freshly-flowering place, to which people came and where they liked to linger on their way. And so I spent a few hours every day painting on the lower flower steps for the whole summer, to enjoy their beautiful view.